Given the esteem and genuine affection with which generations of people have regarded the Emperor Norton since the start of his reign nearly 160 years ago, it is surprising how few physical public memorials there are to the Emperor. Apart from the rose-granite headstone that marks the Emperor’s grave at Woodlawn cemetery, in Colma, Calif., the best-known public memorial that one can “reach out and touch” may be a bronze plaque honoring the Emperor for setting out the original vision for the San Francisco-Oakland Bay Bridge — or, as we prefer around here, the Emperor Norton Bridge. The plaque was commissioned and dedicated by the Ancient and Honorable Order of E Clampus Vitus on 25 February 1939. It may have been designed and sculpted by William Gordon Huff (1903-1993), a member of the Order who created many plaques for the group. 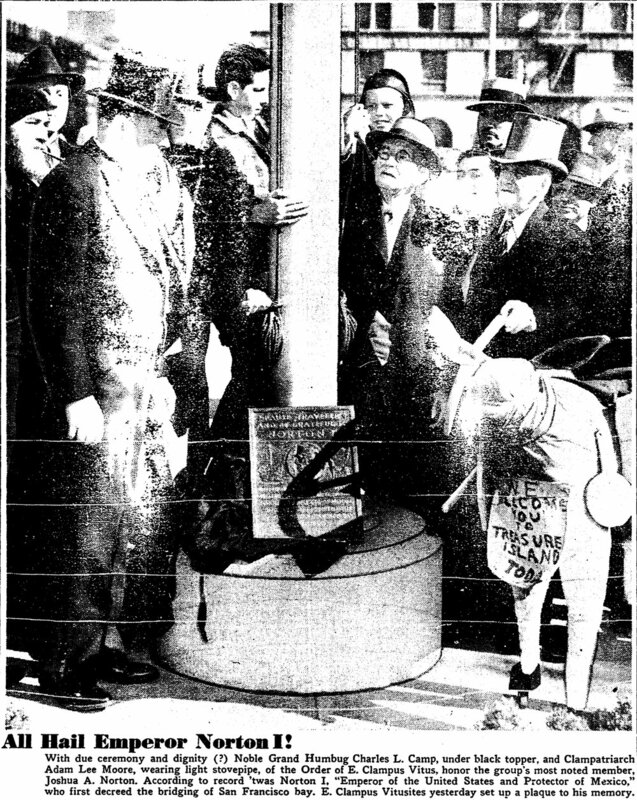 Dedication on 25 February 1939 of the Emperor Norton plaque (“Pause, Traveler”) commissioned by the Ancient and Honorable Order of E Clampus Vitus. Photo from “Bridge Father Honored by E. Clampusites,” San Francisco Chronicle, 26 February 1939, p.8. © San Francisco Chronicle. For full article, click here. Source: San Francisco Public Library. This plaque has traveled a long and winding road since 1939 (read the full story here). At the time of the plaque’s dedication, E Clampus Vitus (ECV) — informally known as the Clampers — hoped that a place for the plaque could be found somewhere in the then-new Transbay Terminal, the recently opened train and bus depot that served the Bay Bridge. As it happens, August 1869 was the date of a fake Proclamation — there were many of these, jokes at the Emperor’s expense; this was one published in the Oakland Daily News — that had the Emperor calling for a bridge “spanning” an absurdly malingering route from Oakland to Goat Island (now Yerba Buena Island) to Sausalito to the Farralon Islands, an uninhabited outcropping of rocks 30 miles off the coast of San Francisco. The original bridge to nowhere. According to ECV records (see descriptions 9, 15 and 45 in the document excerpt here), the escalation and subsequent U.S. involvement in World War II took much of the steam out of the initial effort to find a different location for the plaque. It was 16 years before the plaque was installed at the Cliff House on 25 February 1955. The plaque remained at the Cliff House for more than 30 years before — finally! — being relocated to the Transbay Terminal in November 1986, to commemorate the 50th anniversary of the Bay Bridge. At the Transbay Terminal, the plaque was on Mission Street between First and Fremont, at the street level, on the left side of far right entrance. Many who have any memory of the plaque remember having seen it at the Terminal, where — as reflected in the photograph below — it had been blackened and oxidized by time. Emperor Norton “Pause Traveler” plaque (1939), commissioned by E Clampus Vitus to honor the Emperor for setting out the original vision for the San Francisco-Oakland Bay Bridge. Photograph © 2010 John Nagle. Source: Wikimedia Commons. When the old Terminal closed in 2010, to make way for the construction of the new Transbay Transit Center, the plaque was taken down and has been out of public view for eight years. Recently, the plaque has been restored with a view to reinstalling it at the new Transbay Center. It’s been a couple of generations or more since anyone has seen the plaque shining like this. Emperor Norton “Pause, Traveler” plaque (1939), as restored in 2018. Photograph © 2018 Kai Wada Roath. The restoration was completed in October 2018 by Lars Nylander. By day, Nylander — who is a Clamper — works at the Fine Arts Museums of San Francisco (deYoung; Legion of Honor) building out exhibitions as a lead member of the Museum Technicians Department. In late October, the plaque was displayed at a San Francisco event of Yerba Buena #1, the “mother lodge” of E Clampus Vitus. So, where to from here? When will the plaque be reinstalled, and where? there has been space on a wall at the Bus Deck Level (between Shaw Alley and 1st Street) that has been identified for installation of the plaque. Details are still being worked out but we look forward to piquing the interest of passing bus patrons with the hope they Google the Emperor for more information. This would be on the Minna Street side of the Center. The Emperor’s Bridge Campaign is grateful to the Transbay Center and members of ECV Yerba Buena #1 for pushing this project forward — and to Lars Nylander for the beautiful restoration. It will be good to welcome back into the public arena this rare and wonderful tribute to the Emperor.